Heather and Kerry Alice, of Twigs and Heather, have new work that includes a sterling silver seashell collection. 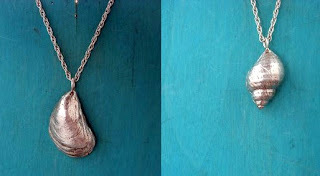 They collect shells on North Shore beaches, then mold and cast them in sterling silver. Check out these wonderfully organic pendants on their website or in their website and in their Etsy shop. 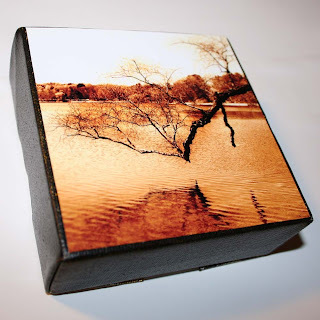 Also inspired by nature, Lucie, of Lucie Wicker Photography, has been working on a series of sepia toned photographs mounted on square painted canvas. The contrast of the sepia with the black canvas is striking. These wonderfully calming photographs measure 4x4 inches and are available for purchase on her Etsy shop.